A number of things may come to mind when the film, Sabrina, is mentioned. For sure, topping the list of items is the late great Audrey Hepburn, who played the character of the chauffeur’s daughter gracefully (she was nominated for an Oscar for this role). Then, there’s the classic love triangle involving Sabrina, David, and Linus. As for me, mention Sabrina, and the first thing I will tell you is soufflé! My favorite scene involves Sabrina escaping to Paris after being heartbroken with Linus, as he never noticed her at the beginning. Still heartbroken, she attends culinary school, where, in one scene, all students are asked to make a soufflé. As the professor inspects (criticizes) each dish, he goes to his last two pupils. Baron St. Fontanel, an old gentleman, does the perfect soufflé. On the other hand, Sabrina fails as she didn’t even turn on the oven! He then tells Sabrina, “A woman happily in love, she burns the soufflé. A woman unhappily in love, she forgets to turn on the oven.” Somehow, this starts a friendship between the two, and Audrey Hepburn’s outlook – and look — start to change. She gets a makeover, and goes back to America. And the rest of the story is in the DVD. I had wanted to make a soufflé since then, but never had the time to do so. Admittedly, I also have been intimidated by it. Separating egg whites and yolks are not in my natural comfort zone as compared to say, pasta. The soufflé is a dessert that requires a little more technique than making brownies or apple pie. And so, I have spent so many years being happy with just having a taste of it in restaurants here and there. But of course, I cannot stay intimidated forever. And certainly not when I have a food blog! I did create this blog, after all, to also conquer my fears, and conquer new heights in my culinary journey. After benchmarking with different recipes, I created my own. It’s a chocolate soufflé recipe, made simple because of its ingredients (no complicated ingredients here). It’s fairly simple to make. And the taste? It’s rich because of the chocolate yet light and fluffy. Who knows, you may even sing La Vie En Rose like Audrey when tasted. 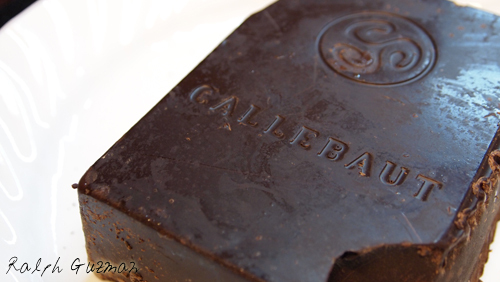 I used this Belgian chocolate bar, which I purchased in Minneapolis. It’s very delicious! To easily separate the yolks from the whites, it’s always best to chill the eggs (especially if you live in a country with tropical climate like the Philippines!). The funny thing with me is I placed the eggs in the freezer with the intention of taking them out after a few minutes. But I forgot about the eggs and left them in the freezer overnight. The following morning, I brought them out and got them thawed for about 15 minutes. Guess what. The accident allowed me to separate the yolks and whites more easily. 🙂 By the way, is this a “Hidden Mickey” I see? 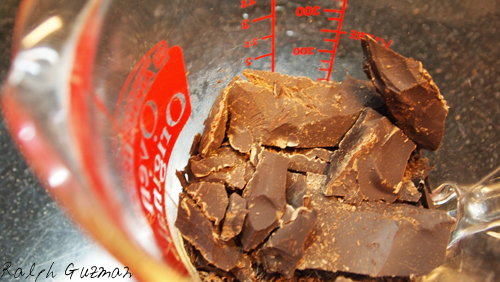 Melt the chopped chocolate using a double boiler. I use a pyrex bowl, which I put on top of a pot with simmering water. Given the very delicate nature of chocolates, I do not melt them in direct heat. They taste awful when burned. I put a teaspoon of butter first onto the pyrex so that the chocolate does not stick to it. 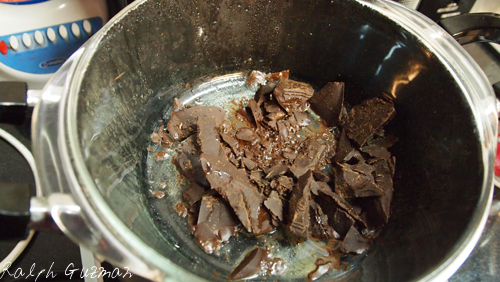 Once the chocolate has melted, remove from heat. Mix in egg yolks, lemon juice, salt, vanilla extract, and coffee powder. Set aside. 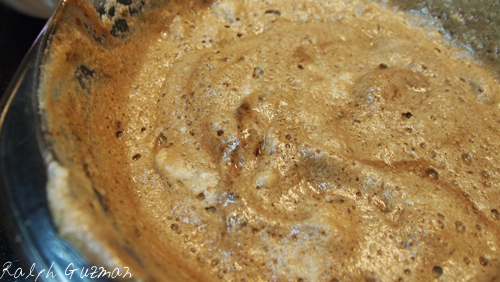 The mixture should be liquid enough, so that it allows you to easily mix in the egg whites later on. 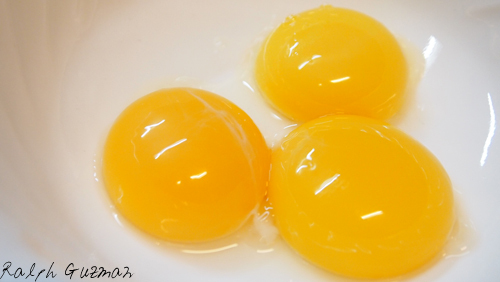 If you have a hard mixture, you can add 1 or 2 egg yolks. You can also add 2 tablespoons of vegetable oil. Set aside momentarily. 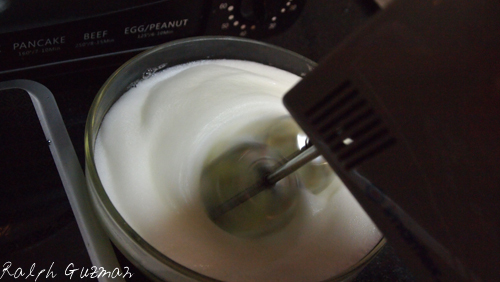 Using a hand mixer, beat the egg whites in medium speed. 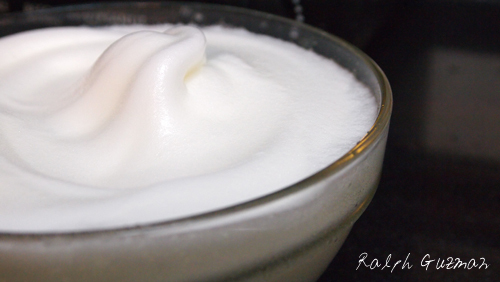 As the egg whites start to foam up, gradually add the sugar and then increase to high speed until you have stiff peaks. At this point, the egg whites be full of air. Gently fold in the egg whites into the chocolate mixture. The goal is to keep the air in the egg whites. And so, do not mix aggressively. 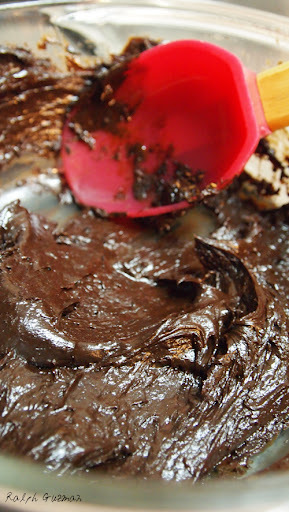 Fold it until the egg whites are fully incorporated into the chocolate mixture. Put the mixture into ramekins that have been brushed with butter. In my case, I used mini oven dishes, which I bought because of their beautiful red color. You’ll be able to make soufflé for 6 small ramekins– or 3 if you’re using slightly bigger ones, which I used.Bake for 13 to 15 minutes. As it bakes, the soufflé rises and will have a crusty exterior. But inside — it’s creamy, molten chocolate. Make sure to bake within 30 minutes. The soufflé loses its air and becomes heavy if not baked within the time period. Garnish with a sprinkling of confectioner’s sugar (powder sugar). Eat immediately, as it tends to deflate after a few minutes. I considered putting melted chocolate on top as an icing or additional garnish but decided not to, as the soufflé itself already is very rich. 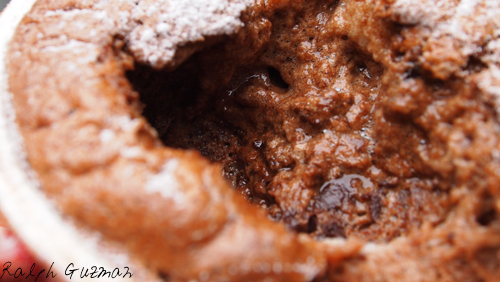 The cross section: crusty on the outside, but soften and molten chocolate at the core. Delicious! Soufflé is one of those dishes that either turns out brilliant or a complete and utter flop but the truth is, it’s not hard to make at all. 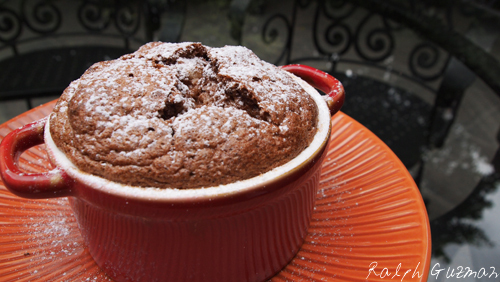 I like this chocolate soufflé recipe because there’s nothing, NOTHING that stands in between you and your chocolate. No monkey business here. French meringue (high-quality) chocolate ganache = soufflé. I don’t even add the egg yolks to the chocolate mixture. I use them in a Grand Marnier creme anglaise to serve on the side instead. 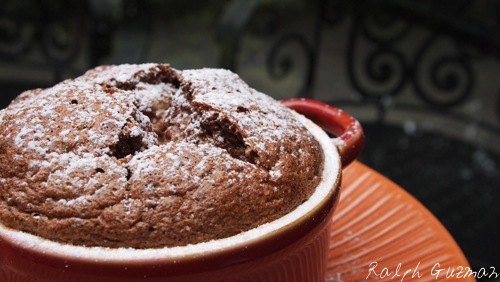 The result is a soufflé that is pure chocolate bliss. That souffle looks amazing! Oh goodness, I can’t stop staring at that yummy molten chocolaty core. ← Previous Previous post: Singkamas Pie, Anyone?